Courtenay Taylor, the voice actress who played many iconic roles in games, has a major role in Fallout 4. Taylor plays the default female character, which means anyone starting a female character will be hearing her voice for the entire game. “I’ve never worked this long on a game and I think that does affect my excitement but also the material is great,” Taylor told IGN, revealing that she recorded 13,000 lines of dialog over two years. “The writing is great. 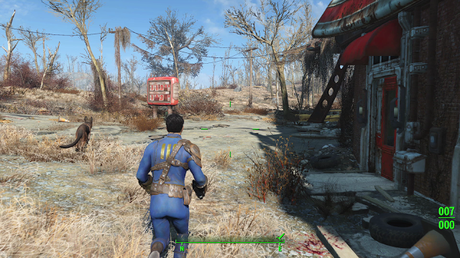 It is exactly what you would expect from a Fallout game, but better – it’s more immersive. They’ve taken it to a new level. “There’s no stone that’s been unturned. It’s like – I went to Pixar, in Emeryville once. And they were talking about the movie Cars, and the level of detail in Cars. In every car, they would know what was in the glove box, even if the glove box is never opened, these creators would know exatly what was inside. Taylor went on to add that she felt she’d shot “an action movie with heart” after finishing work on Fallout 4, and that’s because fans expect writing to be “more cinematic” these days.